Based on the famous Dr. John R. Christopher formula (with amendments made to comply with EU legislation but still just as effective), this combination of 9 active herbs is known as the ultimate herbal laxative! 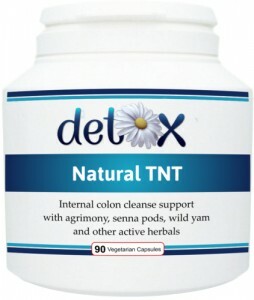 Natural TNT is a fast-acting colon cleanser, designed for the chronically constipated in need of strong treatment for a blocked bowel. Purgatives have been combined with carminatives to prevent griping. It is a powerful intestinal cleanser which will "blast loose" residual intestinal congestion and get users off to a flying start with their bowel cleanse program. used by colonic hydrotherapists before, during and after treatments. Dosage: 1 or 2 capsules, to be taken 1 to 3 times per day or as advised. NOTE: This is a strong herbal colon cleanser and (as with all colon cleansing supplements) should be used in conjunction with improved eating habits, increased water intake and a sensible exercise regime.